Tour ends: It’s up to you. Transfers Corfu in cooperation with Vido’s Travel, are organizing long day tours from 4-6 hours long for those visitors of Corfu island who would like to meet some of the most representative places of the beauty and the history of the island. Every tour begins from the place of your departure which is either your hotel or accommodation place or the main port of Corfu island. 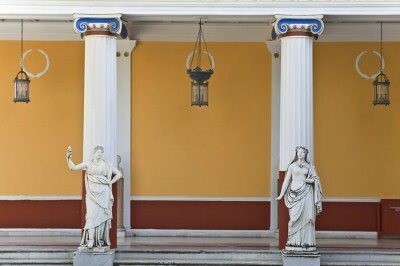 So for this tour your coach will be waiting for you at the time of your request at the departure place and by following the National Road of Lefkimi, you will be transferred in a comfortable and air conditioned environment to the village Gastouri where the amazing Achillion Palace is situated. After your tour into the palace by a professional tour guide if you choose so, you will depart for your next destination the famous Kanoni. According to archaeological studies Kanoni is the area that coincides with the boundaries of the ancient town of Corfu. It was named so, because of the artillery that had been set up there by the French, during the first French occupation of Corfu island. Kanoni is a place of breathtaking beauty with a magnificent view to the island with the monastery of Vlacherna and the Mouse Island, Pontikonissi, which according to the legend it was the ship of Odysseus which was turned into stone by the god Poseidonas. After Kanoni the tour continues to the Old Corfu Town Center. Your coach will leave you close to the beautiful Square of Corfu. 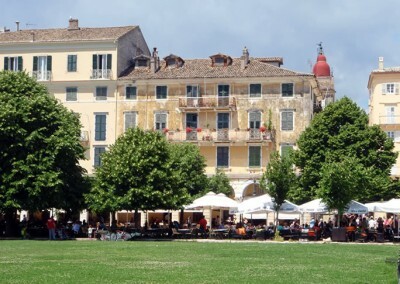 Old Corfu Town is considered to be the Jewel of Corfu island. It is delimited by the two ancient fortresses, the old one and the new one and it is distinctive deeply by the Venetian element. It is an impressive combination of massive forts, palaces, narrow streets and tall western-style buildings. The oldest neighborhood of the city is called Kampiello and it is characterized by the very narrow streets and tall buildings. Focal point of the old town is the Espanade Square which is considered the largest square in Greece and it is located opposite the old fort. On the west side of Esplanade is situated the famous Liston. It is the cosmopolitan center of the Old town and you can enjoy a coffee or a drink to one of the many cafes that are situated under the arches. The name of Liston it is said to come from the “List”, in which were listed the names of the nobles, the Libro d’oro, who were allowed frequenting to the particular area. Into the Old town you will also have the chance to do some shopping to the local market and of course to visit Saint Spyridon Church. Saint Spyridon is the Saint of Corfu and protector of Corfu island because it is said to have saved many times the island from disaster. The Church of Saint Spyridon is situated behind Liston and is considered to be one the most important religious monument. Completing your walk and your tour to the old Corfu town center you will be picked up again by your Tranfer Corfu’s bus and return to your tour’s starting point.